CAPPADOCIA CAPTURED OUR IMAGINATIONS DECADES AGO AS A 'MUST VISIT' and the passing of time had heightened our expectations. The reality is so often an anti-climax but here, in the middle of Turkey, it was quite the opposite. The oft-used description of 'Lunar Landscapes' certainly falls far short. This is not a bald, monotone, virtually featureless stony desert at all  the rocks are of many hues, from subtle greens and reds through to vivid sulphurous yellows. And the rock forms  so varied and over a vast area  range from bizarre pinnacles with precariously perched hats to a sea of waves seemingly frozen in mid-flow. In between many of these rock formations, small and large patches of farmed land, both arable and orchards, add soft dashes of contrast. At every turn, the features change: no two vistas are the same. So much so that although we took over one hundred photographs a day, we only just scratched the surface. Here nature is arguably at its most imaginative. And neither has mankind been slothful; burrowing into the soft rock for some 5,000 years to create many thousands of caves. This is truly unique: Cappadocia's landscape is found nowhere else on earth  or even on the moon. Whilst the area is large, the central part is fairly representative of the overall Cappadocian landscape, and can be enjoyed at a relatively relaxed pace in three well-spent days. We became rather blas� on the historical aspects as there is so much to see and learn  the 13th century, in this setting, seems almost like yesterday. Elsewhere, the minor sites of Cappadocia would be major trophies. If you are a keen historian, walker, horse rider or enjoy white water rafting and relaxing in good quality, individual and high-standard cave hotels, you will find that any extra days are well rewarded. We found the guidebooks a little wanting in assisting us to organise the right balance and ingredients for our purposes; some were even misleading on basic data. However, we were introduced to Euphrates Tours who responded to our abnormally demanding brief with a well-balanced programme, together with great ground arrangements. We found that the Euphrates' guide  Remzi (pronounced 'Ramsey')  is highly respected throughout the area for his extraordinary in-depth knowledge on the history of the region. Not only is he a great communicator who can convey this knowledge with a stimulating freshness, but he also has a wicked sense of humour. Self-drive is a good option as the roads are not busy. The signs are clear and standards good, except on the smallest by-roads. Just watch out for slow moving traffic  tortoises are at large and take ages to cross the roads, although it's heartening to see that most are given a helping hand by drivers. We arrived unruffled and on time, on a Pegasus Airlines' flight to Kayseri's small airport. It was to be an hour's transfer in darkness to our hotel on remarkably good and virtually empty roads. There were few lights in the countryside but the profile of low mountains in the background could just be seen. It was only for the last few miles that we drove on a single carriageway, and everything seemed all too easy and comfortable for a soft adventure holiday. But this was to change abruptly. When we arrived in Ayvali Koyu village  a simple, dusty village with agriculture as the main occupation  our driver turned unexpectedly between some buildings into the narrowest of roads. Actually, more a pathway... Without warning the road suddenly plunged down into a ravine and we rattled across a small stone bridge before coming to a halt in front of a combination of small buildings and caves climbing and nestling into the ravine's side: the Gamirasu Hotel. Pure Indiana Jones. The whole scene would have cost a fortune to create in Hollywood but it was nature's hand that had been hard at work here. Opposite the hotel there was a whole series of caves, some illuminated and obviously occupied by both humans and animals. When daylight came we could see and hear the cows, lambs and cockerels in the caves opposite our bedroom. The scenery was only a part of the magic, with the stream providing background music to the stars of the show  the nightingales and their song. The locals believe the nightingales sing to provide comfort to their mates whilst they sit in the dark on their eggs. What a delightful story. In the converted monastery  originally carved out of the rocks some 1,200 years ago  we were given an unsurpassed welcome by Baris the Manager and his friendly staff. Despite the late hour we joined the rest of the guests, glass in hand, to listen to the Saz player who was singing folk songs accompanied by Baris on a drum. The Saz is an emotive traditional stringed instrument. We discovered that our fellow guests  many of them repeat visitors to the area  had a common interest in finding the 'real' Cappadocia, and enjoyed immersing themselves in the locality. There is much to explore from the Gamirasu Hotel where, for the record, all mod cons are available together with, for those with withdrawal symptoms or as a necessity, free internet access. Bicycles and horse riding are available, also free of charge (other hotels usually charge for riding) and it is well worth taking the time to explore the gorge either mounted or on foot. At the time of our visit in May everything was covered in wild flowers, although they are best in March/April. Interestingly, many of these flowers we recognised from our own garden in England. 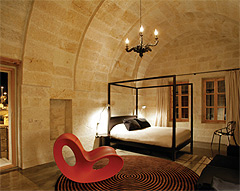 In all the hotels, the accommodation is in a combination of ancient caves and rooms made of stone. Many of the latter are vaulted, but all have great character. Most of these caves have been lovingly restored without any structural additions so that they blend harmoniously with the natural surroundings  and you certainly know exactly where you are when you wake up in the mornings. The Gamirasu Hotel has 26 rooms  and enough ancient caves to add many more. Sensibly, Suleyman and his cousin and business partner, Ibrahim, do not plan to expand much more as they intend to retain the intimacy and 'private house-party' atmosphere. There are many small terraces, gardens and places where you can find privacy; hideaways in which to curl up with a book or a drink. Or both. There is a change of style, guests and scenery in our second choice of hotel, Serinn House in �rg�p  one of the main centres for visiting this mysterious and extraordinary troglodytian landscape. This is the second year for Eren, who after two decades in the international air travel and hospitality business  including several years in London, Rome and Istanbul  has finally realised her dream of running a stylish and individual hotel. This boutique hotel is operated along the lines of the best and very successful New England Inns as she only has five rooms, each of which features modern-classic furniture by eminent designers. A fashionable Turkish architect was responsible for the overall design and the feel is reflected in the translation of the name Serinn: 'Cool'. Everything is carefully considered and works well, from breakfast to the Ron Arad and the Charles and Ray Eames designer chairs. At the Serinn there is no compromising the comfort that a minimalist approach would have lacked: comfort physically, as well as to the eye, is elegantly achieved. Breakfast or a cooling drink may be taken on the elevated terrace with wonderful views across the small town and surrounding mountains. There is a selection of restaurants nearby and the nearest  Ziggy's  is really an outpost of Serinn House. You can dine on one of several terraces; but no designer chairs here  these are made from period bedheads. A super idea, and very appealing. The guests at Serinn House were more likely to have a Blackberry with them; whilst those in the Gamirasu Hotel would be more likely to be picking blackberries! In both cases the guests' interest in exploring places like Cappadocia was the catalyst in overcoming any conflicts that would have existed in more conventional holiday areas. For our final choice, the Museum Hotel above Uchisar was the grandest  although still relatively small with 40 bedrooms and suites. This was the highest elevation for hotels in the area and, at any time of day, the views were simply stunning. Early birds can see as many as thirty colourful hot-air balloons drifting across the valleys  a truly captivating sight. 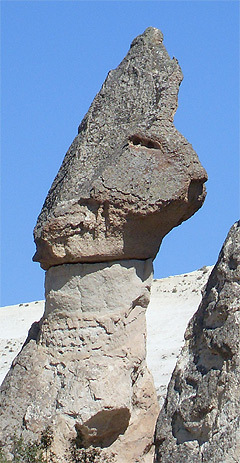 Uchisar is dominated by a large rock reminiscent of a rather large Emmental cheese. If you climb to the top  Beware! There are no barriers  you will be rewarded with fantastic views. The amazing wind-blown pinnacles of sandstone and pumice shot through with minerals that add pinks, greens and reds, along with iron, copper, sulphur and others is something you will see nowhere else on this planet. One very strange sight was the Museum Hotel's flock of pigeons. They, of course, have their very own cave in a small pinnacle as their loft. I never expected to be mesmerised by these birds but they were seriously different and amusing. The pigeons are great show-offs  they can fly normally or clap their wings, as well as effectively stand up to stall their flight then tumble like an aerobatic stunt 'plane before finally pulling out into a smooth glide. Their pi�ce de r�sistance is repeatedly accomplishing back somersaults in flight. We checked out some of the most spacious suites and never have caves looked as inviting: spacious, comprehensively luxurious in every respect  even a fish pool with a tinkling fountain in one. Forget the Flintstones  this is more Arabian Nights. The formal dining room was extremely elegant and romantic in the flickering candlelight, and offered amazing views across the incredible valley. This, together with the excellent, attentive but discreet service of our waiter Softic and the beautifully-presented food, provided a memorable experience. Even here, there are plenty of secret little gardens, terraces or hidden places to eat. Our own room had great character: we learned how to 'drive' the Jacuzzi in the very spacious bathroom and, in common with all the other rooms and suites seen, the bed covers were works of art. Most of the guests here were looking for the most spacious and high-style accommodation in the region  they will have some fabulous descriptions to take home with them. As a bonus, the hotel has a lovely pool  almost too beautiful to swim in. We found it particularly amusing to watch the resident tortoises promenading along the sides, back and forth, in a typical Mediterranean manner. In each of our hotels, breakfast was outstanding: five-stars all the way. The selection would satisfy anyone, but the real treats were the local honeys, jams (especially the rose and apricot jams) and marmalade, followed by the homemade breads� the list is never-ending. All three hotels are sensitively located and all are in particularly special surroundings. There is easy access to the major sites so the choice is really down to personal preferences in style. Up before the dawn with the cockerels after a day's travelling seemed a strange way to start a trip, but it was worthwhile as the hot-air balloon ride set the scene. We boarded one of G�reme Balloon's many craft; lift off was very gentle as we rose quietly  apart from the occasions when the burners were used. In all other types of airborne craft one has a sense of height and the relationship with the land. Not so in a balloon, where the lack of noise tricks the brain into the idea that what you are seeing is actually a moving picture. But what a picture! Laid out below us we saw the strange rock forms for the first time. There was a very light movement of air so our pilot was able to use the steering on the balloon to maximum effect. He also changed height all the time, so that one minute we would be a few hundred feet above the land, the next literally a foot above the grass or treetops, dipping right down into a ravine with the sides well above us. Now at last we had seen the Cappadocian 'fairy chimneys', the rock pinnacles with improbable caves hewn in every shape and elevation, as well as the 'wave' form of the lower rocks. From the air it was even more dramatic and far, far greater in scale than expected. To float over such an incredibly dramatic landscape is without doubt really one of the greatest experiences. Over 60,000,000 years ago, Cappadocia was a sea. Then, for 50,000,000 years, the volcanoes rained lava  up to 350 meters thick in places  and other rocks across the landscape. The snow-covered mountain Erciyes Dagi is a very visible reminder of that age, and is not unlike Mount Fuji both in shape and the local reverence it commands. The flows varied enormously in hardness of rocks; most have strengths less than pumice and can be eroded and carved easily (one man can carve out a cave room in two weeks) whilst others are as hard as granite. All around there are many types of rocks, including those containing iron, copper, sulphur, etc, so that the colours of the landscape vary right across the panoramas. The effects of wind, rain and  particularly  ice, have fundamentally eroded the softer elements, resulting in cones protected under the 'hats' of harder stones. And no two features are exactly the same. Mankind's influence is very evident with the carving out of caves on a truly massive scale  opinions are divided on whether or not this adds to the landscape. Whatever, by 7,000 BC the population had domesticated animals, grew crops and established towns and villages. Around 3,000 BC, the Bronze Age enabled better tools to be made� and ever more carving followed. Even in those times, people were travelling along the many so-called 'silk roads' and the region was both critical and strategic. To defend themselves, the Cappadocians created cliff settlements, and on the flatter areas dug highly-sophisticated underground cities capable of housing literally thousands of people. There are some 200 underground cities, some burrowing down eight or nine storeys  incredibly, they are not particularly claustrophobic. However, these were only used as places of refuge in troubled times. Artefacts dating from 3,000 to 2,000 BC have been excavated in these cities. By 2,000 BC the Cappadocians had introduced a 10 per cent tax on goods passing through; they charged 20 per cent on loans and operated a 'Green Card' system latterly used by the Americans. Later, they were both the first to sign a peace treaty and to compile books. On the other hand, modern tourism really only gained a foothold in the 1970s (AD). We decided to start our exploring with a leisurely day of touring the quieter but nevertheless important sites of the Sognali Valley. This area is not just about specific sites; almost everywhere you look you will find incidental interest  small churches carved into the rocks, Greek facades on humble farm houses and ruins, wild flowers as brightly coloured as tropical fish, a flock of storks as well as the endlessly-changing rock formations. We headed for Kaymakli where there is a relatively small but good example of an underground city. Here we negotiated a good price for a local guide and this proved to be the best investment possible. His explanation and knowledge provided not only a complete picture of the history of the area but put everything into perspective  something that was invaluable for the rest of our trip. These 'cities' could be inhabited for up to six months and when conditions then became unbearable the inhabitants could move out through connecting tunnels to occupy adjoining caves. The overall length of the narrow tunnels  which probably averaged five feet in height  can, as such is the scale of these undertakings, be measured in miles. Kaymakli has five layers: the topmost being largely for the animals, with the upper classes living higher up in larger caves and the poor in very modest accommodation lower down. The defence mechanism was ingenious  they could seal off the access passages with the equivalent of large mill stones, which were rolled to and fro from the inside. However, those holding siege could not move them as the seal was very effective and their only resort would have been to chisel their way through. Back on the road, we diverted a tad to the farming village of Guzeloz  probably the poorest village one could perceive in the whole area. Farming has split into three elements; arable, fruit and market gardening. The relatively large acreages produce vast quantities of potatoes and some corn. These crops are obviously very profitable as there has been big investment in irrigation and tractors. Interestingly, the crop storage is still in caves. Fruit growing is on a somewhat smaller scale and is frequently fitted into niche areas between the rocks. Lastly, the peasants who live in places like Guzeloz have smallholdings of tiny proportions growing market garden produce and keeping a few animals. The shame is that Guzeloz's hillside setting above a stream is lovely and they have some interesting Greek buildings simply crying out to be restored. We enjoyed an al fresco lunch in the Soganlidere valley park  lots of scrambling up eroded steps, some rather precarious, to numerous little churches. There is a pleasant two-mile walk along the flattish valley floor, with hardly a soul to be seen. In fact, even if history is not your thing, the Cappadocian valleys are perfect for a walking holiday. Another place where we were the only people about was nearby at Sobesos, where a few years ago the only Roman mosaics in central Anatolia were found. 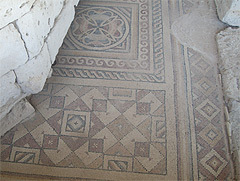 Excavations are in the early stages but the quality and state of the mosaics is excellent. The villa was obviously grand, and its bathhouse would put many a spa to shame. This was already a special day, but the highlight was Keslik Monastery  and yet again we were the only people there. The monastery was carved out of two pinnacles in which three separate areas were defined, including a church with splendid frescos from the 9th century. The elderly curator, who turned out to be the second-generation owner, used his torch to illuminate the biblical tales painted on the walls, and his delivery and commentary certainly added to the atmosphere. Next door was the refectory, where we found a large stone slab surrounded by bench seating carved in stone. We were then invited to take tea and biscuits under a canopy of fruit trees in the beautiful garden full of vegetables, irises, hollyhocks and other colourful flowers. The feeling that this pleasant little ceremony had being going on in these serene surroundings, unchanged for 1,200 years, was extraordinary. Our second day was a public holiday and we were heading for the more popular sites where, to our surprise, there was little crowding even in the main attractions. G�reme Open Air Museum is a large Monastery complex comprising a number of churches dating from the 9th to 12th centuries  some of which have elaborate frescos. Within its bounds are six refectories. Interestingly, it was also home to the only nunnery in the area. Just outside the religious complex is the Buckle church (a buckle was worn by brides) that was carved out for the general public. Whilst the entire cave is truly ancient, the entrance area is called the 'Old' Church (and it is here that the frescos again told biblical stories, with somewhat na�ve style) whilst the inner area is inevitably called the 'New' church. The frescos in the latter have been restored and repeat the biblical scenes, only more elaborately. We visited pigeon valley, so called because the keeping of vast flocks of pigeons right across the area was a necessity for the guano. Much of the soil is really just sand with few nutrients, but by adding the guano it is possible to grow crops. One can spot many grids of pigeon holes at all levels and, in fact, everything seemed to have its own cave  we saw them being used as a chicken run, garage, donkey stable, cart store, potato store, etc. Lunch was taken in the same, and generally unremarkable, little town of Avanos that does have a flourishing pottery industry with products made from thick red clay. Its other claim to fame is that of two armies squared-up for a major battle to determine their boundaries. Just before the inevitable slaughter there was a total eclipse  the gods had spoken, so the generals compromised and agreed the boundaries without any blood-letting. However, its claim to fame for us was the Dayinin Yeri, a simple restaurant where we were served a memorable and very inexpensive meal. A simply scrumptious pudding of Kunefe is an absolute must, even if you don't then eat for a week. This was made up of very unlikely ingredients but was one of the real highlights of the trip. The chef, using a small copper frying pan, made a sandwich of two layers of a pastry resembling shredded wheat (kadayif), with a mellow white semi-hard sheep's cheese (nabulsi) in the middle. This is then fried on each side, turning over when the outer side is crisp and brown before finally smothering the whole thing in oodles of delectable honey. The result is quite, quite divine. I know it is hard to believe but, honestly, it is. There are numerous valleys in the area, including the Kizil Valley named for the glorious colour of its red rock face  particularly beautiful in the late afternoon. Everywhere we went there was something of interest. Presumably unique and amusing was a police station carved out of its own pinnacle. Opposite was a collection of pinnacles with preposterous hats; one hat looked like an English thatched cottage. Everyone plays the game of naming the object or creature that the rock form takes. The imagination can run riot  no reason for formal techniques of brain storming here as the ideas just flow: I saw the spitting image of an unamused Queen Victoria! 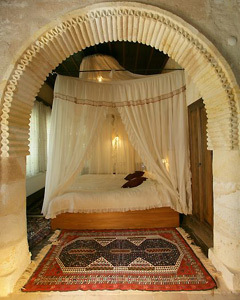 To many, Turkey is principally known for traditional carpets and rugs. Buying them is either a nightmare  "Have I paid too much?"  or a great sport; where quick repartee, humour and wit is often rewarded. We found the sellers in their usual top form and good-humoured sparring was the order of the day. However, something new for us was the unusual local carpets: a combination of pile, embroidery and flat weave kilims, all in one piece. One carpet shop in �rg�p, 'Silk Road', was quite innovative as they buy old kilims from east Turkey. These carpets have soft colours as the wools have been treated with natural dyes which are much more subtle than the modern chemical dyes. They dismantle some of the pieces, clean the wool and then make them up into a patchwork kilim producing attractive modern designs. The world over has some real tourist tat and one can only say that some of the lowest paid can secure an income of sorts from their endeavours. Turkey is no exception. But if you have the patience to sort through the garish displays, there is frequently something worthwhile waiting to be unearthed. We found some pashminas of good quality; the price started out at �32 but quickly plummeted to �10 for two  others may have bargained harder but we were satisfied. Some alabaster work can be attractive and good value, particularly where the stone has interesting figuring  pestles and mortars seem to be very acceptable if not travel-heavy presents. Again weighty  but personal indulgences which are worth chancing the excess baggage lottery for  are dried fruits (especially the darker apricots), Turkish Delight bought loose, rose and apricot jams, local honeys and some spices. For the best prices we bought from local shops. Cappadocia has very hot summers and very cold winters with plenty of snow  you can ski down the slopes of Mount Erciyes near Kayseri. The best time to visit is from March/April/ May, when you can see the abundant wild flowers; June or autumn when the colour of the trees in the valleys is spectacular. Even in the earlier part of the year you will need jumpers or jackets for the evenings, but keep it casual. Given a short brief, effectively every aspect can be organised. They will offer the best operator for specific excursions, not just the one allied to any particular establishment. They also make free telephone calls available to clients via Skype. will oblige with any variation on the theme of car hire. The Peugeot cars were like new and spotless; and nothing was too much trouble for Abdullah. Silk Road  Kayseri Caddasei No. 30, �rg�p. A low-cost operation that has the approach of a good scheduled airline. No charge for allocating specific seats or for a generous baggage allowance. They fly the usual 737s, but with leather seats. They are the second largest airline in Turkey, carried over 4,000,000 passengers in 2007 and are growing rapidly. Tim and Bonnie Stevens flew London Stansted/Istanbul/Kayseri through the new Istanbul airport which is modern, small and efficient and a better bet than the much larger Ataturk Airport. The only downside is that it is on the Asian side: an hour by taxi at 35 Lira (�15). A shuttle bus service is also available. Note that, depending upon the time of day, Istanbul's traffic can be as bad as anywhere and involve much longer journey times.